There is a population group whose genetic make-up predisposes them to adverse reactions to particular substances in food. They emerged from patients whose dermatological complaints were due to salicylates and related compounds [such as additives] in the diet, then from hyperactive children reacting to the same compounds. The tendency for adverse reactions runs in families. Investigation over the last thirty years has revealed a core of suspect chemicals known to produce adverse reactions in this susceptible group. The tendency to react is not particular symptom oriented, nor is it diagnosis dependant. It is susceptibility dependant. Food intolerance, like allergy is a multi system disorder. Reactions are part of nutrigenomics as there is the possibility that there are nutrient needs specific to the group, but food intolerance is unusual in that the reactions are pharmacological in nature. In order to maximise dietetic care for food sensitive people it is a help for an ill defined group to be as well described as possible. The aim was to build a knowledge base from the accumulation of current research and clinical findings from over 30 years of practice, particularly using a family sensitivity history which shows family symptoms and suspect factors. 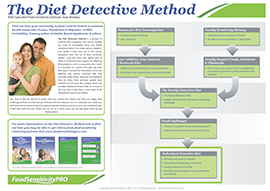 Those most likely to respond to dietary investigation for food sensitivity include those with an atopic family history, as well as having some of another group of symptoms [migraine, headaches, irritable bowel syndrome, mouth ulcers, car sickness, or limb pains], a family member who has adverse reaction to aspirin, those with an increased sensitivity to smell both in food and in the environment, those with an increased sensitivity to taste, and those who have seen a definite adverse reaction to a food or additive in the past. They may also have increased body odour or bad breath. They are less likely to have lifestyle disorders eg CHD, obesity, diabetes or hi blood pressure. At this time the only way to know if someone is food sensitive is to run an elimination diet, so this group will benefit from provision of genetic information. This will allow the best fit between genetic make up, food present in the environment and their preferences. Dietary guidelines that also reflect the genetic make up can be developed incorporating the likely intake of the human population in prehistory when the load of suspect foods was much lower. With new directions in the food industry such as development of functional foods care should be taken to minimise adverse reactions. The food intolerant group exists. More formal study using the above findings would further clarify the genetic predisposition and dietary requirements.